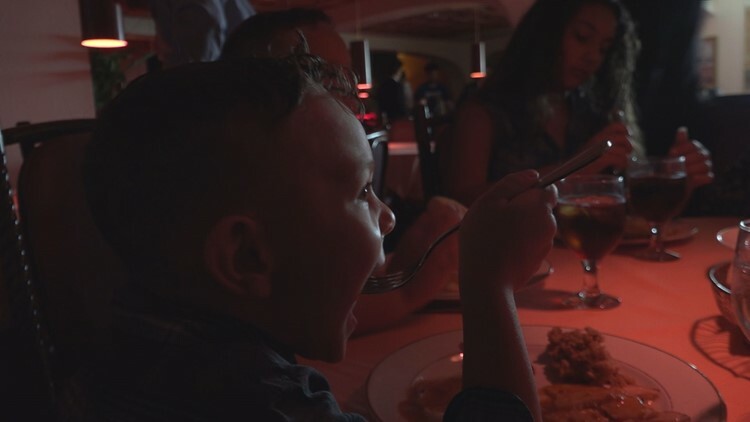 Families gathered at Donatello Italian restaurant in Tampa for a free meal. On Thanksgiving, Tampa's Donatello Italian restaurant welcomes some 1,000 guests of honor and treats them as such, with a free meal and other surprises. “It's this fancy restaurant that you go, and they're like ready for you, and if you have just a little bit of water, they're like, 'Would you like a refill? '” 11-year-old Evan Post said. He looks forward to it all year. “I like getting the presents, and seeing the superheroes, and the dessert. That dessert is the best,” Evan said with excitement in his voice. After lunch, the children take pictures with their favorite movie characters and get to take a gift home. The whole event is fun for the kids and convenient for the parents, especially those with many kids like the Posts. “It's very hard for a large family to go anywhere to eat,” said Jon Post, Evan’s adoptive dad. The Posts have six kids, a mix of biological, foster and adopted. It’s their fourth year coming to Donatello’s on the day the restaurant transforms to bring joy to local families. “It's our way to give back to the community that takes care of us,” said Gino Tiozzo, owner of Donatello.